It feels like we’ve published a lot of posts on Direct2Dell lately about the Internet of Things (IoT); but, Gartner predicted that 4.9 billion connected “things” would be in use this year, and that the number would grow to 25 billion by 2020. With that kind of scale in mind, our posts on an IoT survey and infographic, agriculture and connected cows, IoT World and challenges at hand, IoT security, how IoT supports sustainability and Dell OEM Solutions’ role in all this seem to only scratch the surface of the topic. And, while my first-generation Flip video camera may be collecting dust alongside my Rio MP3 player from the 1999 Vans Warped tour, Barton George recently put his to good use shooting several short videos while touring our Internet of Things (IoT) Lab in Santa Clara, California. You may know George as our internal developer advocate who came up with the idea for Project Sputnik- our linux-powered developer edition of the XPS 13. In the first video he shot, Dell Product Technologist, Raja Tamilarasan gives an overview of our IoT lab, talks about IoT in general and explains where Dell plays in the space. George and Tamilarasan go on to discuss what type of customers utilize our IoT lab, Tamilarasan then takes us through a smart building showing how the sensors are attached to a Dell IoT gateway which constantly monitors the data it receives. Tamilarasan even simulates a fire showing how the building would react; and, goes on to demonstrate how, using Dell’s cloud integration software Boomi, you can migrate aggregated info from a thin client back to a server in the data center. The opening of the lab, co-funded by Intel, was another milestone in the Dell and Intel collaboration on IoT. We are both part of the Open Interconnect Consortium (OIC) that sets standards for connecting a multitude of household gadgets and appliances, and Dell OEM Solutions, is a premier member of the Intel Internet of Things Solutions Alliance. And, to make it easier for more customers from around the globe to do that, we recently opened another IoT lab in Limerick, Ireland, where we’re also expanding research and development through the hiring of highly skilled engineers. 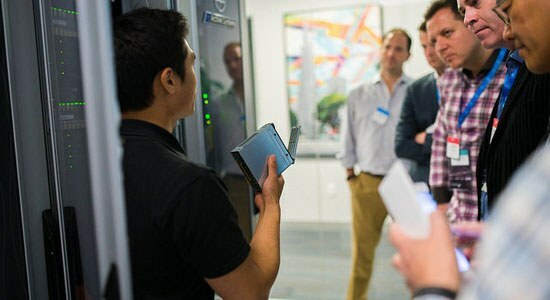 If you’re interested in your own tour of our labs, visit dell.com/iot and select “Contact a Dell OEM Expert” to connect with our team.